A man has lunch in a heated place for homeless people in the courtyard of the Synodal department for church charity and social services on Nikoloyamsky street in Moscow. According to various estimates, between a 1.5 million and 3 million people in Russia are homeless. An RBTH correspondent accompanied volunteers from the Moscow adaptation center for the homeless as they went on their nightly rounds and learned how the homeless survive in the most densely populated city in the country. A small minibus, a driver and doctor (both burly men in their 40s), two very young-looking girls (second-year students at Moscow State University), several warm jackets (donations from compassionate citizens), pairs of trousers, gloves and hats, three urns of hot soup (broth with potatoes and slices of beef tripe), tea, bread, bandages and medicines. During the night we will visit all of the city's railway stations. There are nine of them in total; every day they handle over a million passengers, but not all of those arriving know where they will head next. Vladimir who looks older than 50 (he says he is 39), arrived at Kursky railway station from Ryazan Region (150 miles southeast of Moscow). He lost his village home in a blaze and with it his identity documents. Without waiting for help from the state, he found a job as a laborer and lugged bricks for two months; he was never paid for his work but chose note to go to the police or the labor inspectorate, and simply embarked on a drinking spree. He has been begging at the railway station for over six months now. During this time he has had his nose broken in a drunken brawl, been robbed twice and has even spent a night in a police cell before being released. This is his first winter on the streets. "It is good that it is not too cold (it was minus 11 Celsius/plus 12.2 Fahrenheit outside - RBTH)," he says, gulping down his soup. "Seasoned people say that when it is minus 25 or lower, even if you manage to get into the entrance of an apartment block, or spend the night in a pedestrian underpass, you can end up with frostbite. Many here have had fingers or toes amputated. This happens after a long spell of freezing temperatures." There are seven centers for the homeless in Moscow. They look like cheap hostels, except they have medical staff and proper guards. They have spacious rooms with lots of bunk beds and a communal kitchen; the showers and toilets are also shared - they are located at the end of the corridor. In total across the city there is sleeping accommodation for 1,138 people. Places at the centers are free, paid for by the state. But in the summer half of them are unused. "And even now a third of all places are vacant," says Nadezhda Tretyakova, deputy director of one center. "But when it was cold (early in January the temperature in Moscow plunged to minus 32C/minus 25.6F - RBTH), it was very crowded." 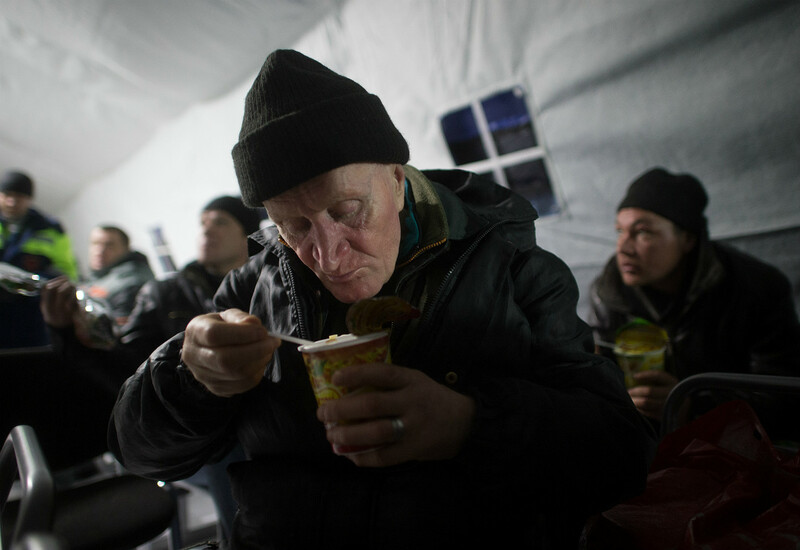 At first, Nikolay, an elderly man who is sleeping in an underpass near Kievsky railway station, almost goes for us with his fists but, after having put a warm jacket on his shoulders and eating a bowl of soup, he says that he had been to a state night shelter but didn't like it there. "It is all very strict. I can tell you as a former prisoner that the discipline there is worse than in jail. One has to sign papers - this isn't allowed and that isn't allowed. They can even hand you over to the police if you fail to observe the rules." Asked what exactly one is "not allowed," Nikolay honestly and with annoyance responds: "Drinking alcohol. No way can you smuggle it in. And at night you can't talk to anybody - you have to observe total silence. And what they give you to eat there is some kind of fast food and a thick fruit drink. I may be homeless but I am not accustomed to living like that." Nikolay, says he makes about 500 rubles ($8.40) a day by begging from passersby - enough for vodka, as well as for bread and sausage. It turns out he "earns" twice the national minimum wage. "Why on earth should I need anything more?" Kolya (short for Nikolay) adds. There are, however, some among the homeless who avoid night shelters for different reasons. Adaptation centers provide services only if a person submits a written application with all sorts of information about themselves, which is thoroughly checked. It is not just that not all homeless people have identity documents, but a considerable number of them have no desire to report to state bodies because of a criminal past. Hence there are no accurate statistics about the homeless; polling companies collect statistics and their data vary a lot. At Paveletsky railway station we meet a whole community of the homeless. Police patrolling the area are less respectful - they call them the mafia. As one policeman told us, every morning the homeless gather behind the station building to receive their instructions; then they part company, but in the evening they get together again and put all the money they have made begging during the day into a common kitty. Yury, a homeless man nicknamed Eau-de-Cologne, (the name derives from a popular source of cheap, but strong alcohol in Soviet times), is manager of the kitty, we learn. He has been living on the streets for more than two decades. Having refused help out of principle, Yury tells us that he had served a prison term for petty theft and, while he was inside, his wife bribed officials to change the ownership documents of their flat and put it in her own name making Eau-de-Cologne homeless. "At one time I served in Afghanistan, I was a sniper," he recalls with pride. "I had awards, but I've sold them all." Yury's story is quite typical: About one homeless person in three is a victim of fraud involving property. Debtors are slightly less common and refugees from conflict zones even more rare. There are also some like the elderly woman with a bruise under her left eye that introduces herself as Irina Stanislavovna. She has been living around Kievsky railway station for over two years - because her relatives want to poison her. In fact, she does have a home, just six miles outside Moscow, but, apart from her, her daughter and son-in-law are also registered as residents there. "I saw them adding poison to my dinner. I'll never cross the threshold again," she complains, refusing to eat our soup for the same reasons. The volunteers, who go on their nocturnal rounds at least once a month, say this is not the most bizarre case. One homeless man from Voronezh, who lives in Chistye Prudy (an area in central Moscow), is waiting to be picked up by aliens. They made an appointment with him precisely in this area but didn't tell him the time and the day they will come to collect him.